Caption slip reads: "Photographer: Hecht. Date: 1959-01-08. Reporter: Kay. Assignment: Interview. 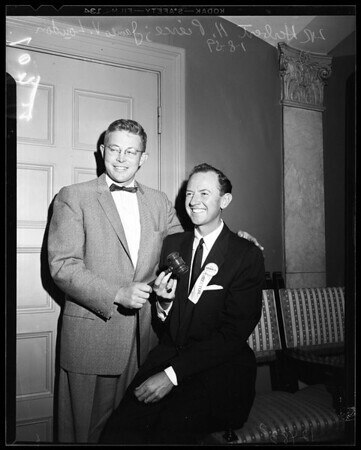 101/102: L to R -- Herbert H. Pierce, outgoing president, presents gavel to incoming president, James V. Loudon (R) at Foreign Trade Association luncheon-meeting."